The latest in my “Adventures of Old Home Ownership” series about my own experience owning an older home; a one-owner, 1955-built home in Sugarhouse (a hip suburb of Salt Lake City). Even an experienced agent like myself will run into unforeseen circumstances when it comes to these character-filled houses. The key is to take it all with a grain of salt, keep your sense of humor, and start buying beer by the case. If a home was built in the 1950s, it will almost always have galvanized steel pipes, the wonder product of the time. Just like the giant rolling boulder booby trap was replaced with the floor and ceiling spikes, these products have been replaced by new and improved technology. 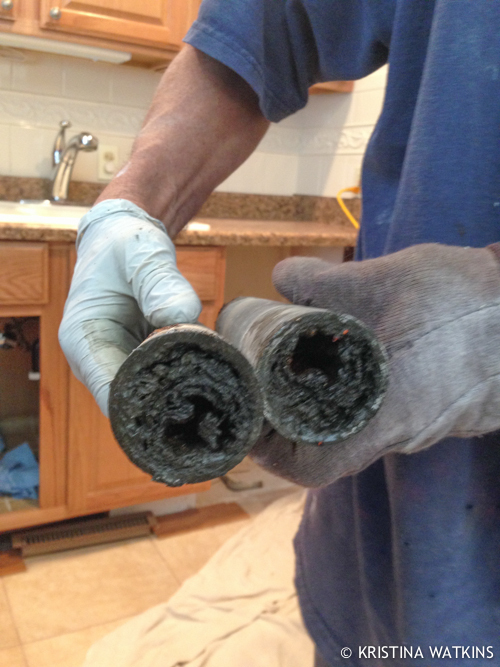 No matter what, have a plumber inspect all of the pipes and write a bid to replace them as part of your due diligence process when buying a house. Even if the seller tells you it was all replaced, whether you have orange water or not, bad pressure or not, PAY FOR A PLUMBING INSPECTION. 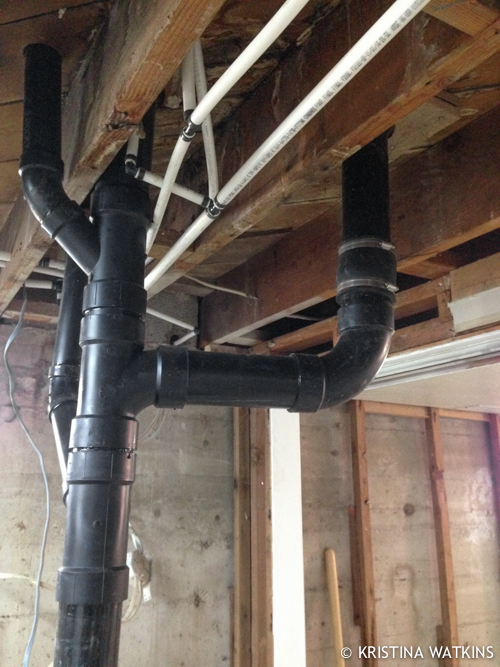 Replacing all the galvanized pipes in a house will have to be done and can run in the $5,000-10,000 range, so it’s best to know up front how long you have before you will have to do it. If you can help it, just plan to replace it all right off the bat. 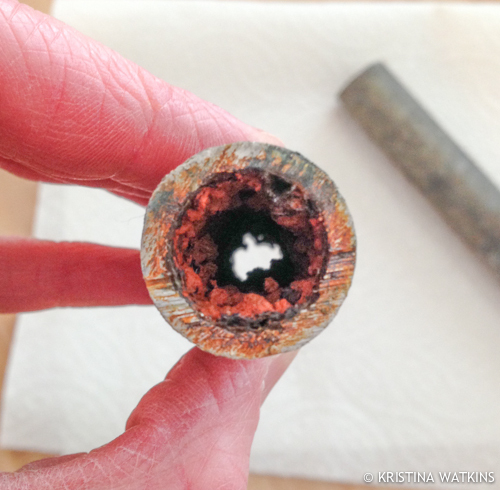 Rusted pipes cannot be fixed. The rust will continue to clog up the pipes until you have no water pressure, and the rough surface of the rust will attract sediment and other bits of dreadful until you have ticking time bombs full of black death. 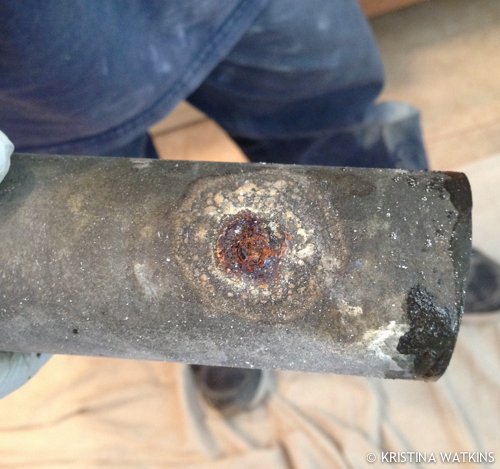 I say bombs because eventually (60 years in this case), the rust will eat through the pipes. In a typical house made of wood with plumbing behind walls, THIS IS BAD BAD SO VERY BAD. It’s all got to go. If at all possible, this is work you want to have done BEFORE YOU MOVE IN. And if not, plan to go on vacation while this is happening. The process is arduous. Jackhammering. Moving toilets. Climbing on roofs. Holes in drywall. Crawling through cabinets. Find an experienced plumber who does pilates. This is the “after.” In a fortunate disaster, we had to un-finish the whole basement (foundation leak, that’s another story) so the plumbers had easy access to everything. 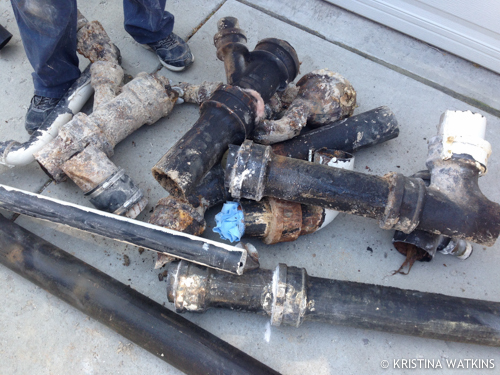 Normally they would have to cut through tile, floor, and ceiling to get at the pipes. The new technology of the times is called Pex: pipes that are chemically neutral so they are impossible to rust and do not attract any hard water deposits. The short of it is that there are very few forces as terrifying as water. If the water coming in or going out of your home is at risk, that is not a force to be reckoned with. You pay the money and you get it done. And frankly, in an older home, it’s best to just plan on getting it done no matter what. But hey, equity! But let me tell you, there is nothing as good as that first hot shower with full pressure, no orange water, and without the crippling anxiety that your pipes are going to burst into a biblical chunky waterfall in the middle of your new love nest.